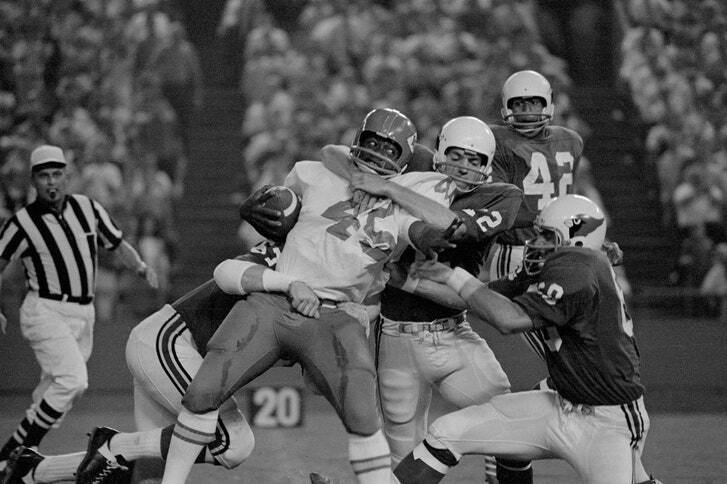 David Meggyesy, far right, who played for the St. Louis Cardinals in the sixties, in a game against the Kansas City Chiefs in 1969. Meggyesy’s private opposition to the war grew more formal, and he started hosting meetings for other citizen activists at his house, and paying for buses to deliver them to marches in Washington, D.C., and New York City. “I was into it, but I wasn’t public about it,” he said. Nonetheless, he started converting some of his previously apolitical teammates, and, in 1969, he got more than thirty of them to sign a letter to their local congressman, calling for a withdrawal of American troops. “Then, suddenly, a couple weeks later, I’m benched,” he said. I thought again of Meggyesy, and of his complicated feelings about football and Nixon, while watching the league’s season opener, in Philadelphia, between the Falcons and the Eagles, on Thursday night. It marked the beginning of the N.F.L.’s ninety-ninth season, at a moment that is sometimes described as “peak football”—a nod both to the sport’s cultural hegemony and to its perceived vulnerability amid concussion concerns, cord-cutting, divisive politics, and the occasional ineptitude of the current commissioner, Roger Goodell. I’d been reading Mark Leibovich’s new book, “Big Game: The N.F.L. in Dangerous Times,” which posits, in the introduction, that the country’s dominant form of entertainment, in the age of President Trump, “no longer felt safely bubbled off from the messiness and politics of the larger American reality show,” as though this were a phenomenon without precedent. Leibovich, a national correspondent for the Times Magazine and a lifelong Patriots fanatic, writes that, for years, he’d “resisted sports as anything but a walled-off object of my mental energy—toys to play with on the side of all the serious,” only to find that, once he’d started immersing himself in the N.F.L. as a reporter, it no longer seemed like a “respite” from his day job. Trumpism was inescapable. An important difference between fifty years ago and now, Meggyesy stressed, was that Nixon was using football to sell an actual war, and it wasn’t much of a stretch for Rozelle, the commissioner, to imagine that his league’s players might project an obedient, clean-cut image that reflected their own cultural backgrounds. Meggyesy, as he told Cavett, grew up in a “cow town,” the son of a farmer. The teams’ rosters at the time were more than seventy-per-cent white. Trump, on the other hand, is selling only nostalgia (for the days of guilt-free bell ringers, say) to a base that has little in common with the majority of the players on the field, seventy per cent of whom now are African-American. With only a few exceptions, it seems, he doesn’t want you to root for the men on the field. Nor does he want you to root for Goodell (“a weak guy,” he’s said). And he doesn’t want you to root for the owners, either, who represent a club that wouldn’t have him as a member. “Big Game,” in fact, suggests an alternative origin story to the Trump Presidency: maybe it wasn’t set in motion by Barack Obama’s mockery at the White House Correspondents’ Association dinner, in 2011 but, rather, by Trump’s failure, a few years later, to acquire the Buffalo Bills, two decades after having been coldly rebuffed by Rozelle. (“In the end, a seat at the N.F.L. Membership table is so exclusive that even the White House itself has become a consolation prize,” Leibovich writes.) In celebrating the N.F.L.’s declining TV viewership (“WAY DOWN,” Trump tweeted recently), the President may not be using football for any purpose other than to prove himself the only remaining ratings giant in American life. In any event, the anthem in Philly, delayed nearly an hour by stormy weather, and sung a cappella by Boyz II Men, seems not to have aroused the ire of Trump or his Nike-burning supporters. The safety Malcolm Jenkins, a co-founder of the Players Coalition, placed his hands behind his back, instead of raising a fist in the air, as he has done in the past. The defensive end Michael Bennett paced the sideline and finally sat on a bench to tie his shoes. In 1968, it might have passed for disrespect. Kaepernick’s Nike ad—long since viewed and digested on the Internet by anyone inclined to strong opinions on the subject—aired during the third quarter. The game went on.